If you’ve been following my blog then you know that I’m a huge fan of Noiseware (Tutorial) as it is a critical component of my digital workflow. 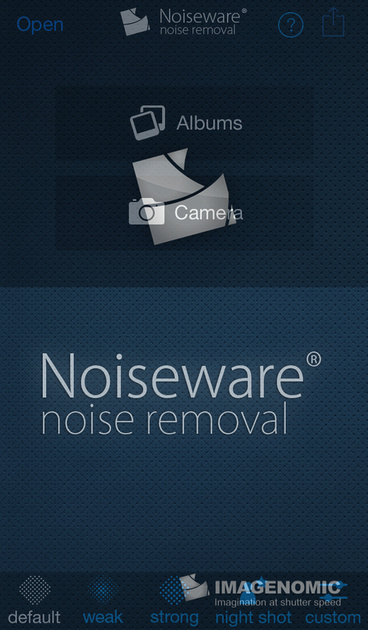 I’m happy to announce that this great noise reduction software has finally made its way to iOS devices so you can clean up those noisy iPhone and iPad images using a lightweight version of this awesome noise removal software. 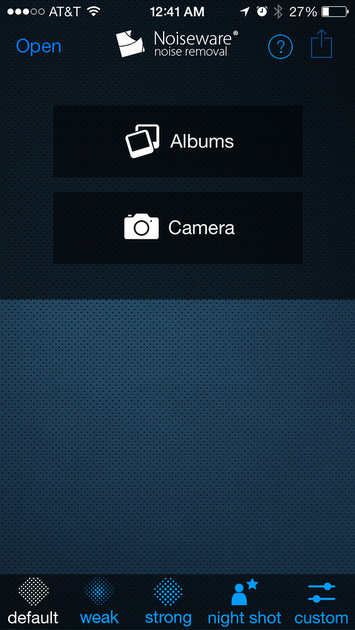 Noiseware for iOS by Imagenomic is a long time coming and the perfect companion to Snapseed users who want to do quick edits on the fly without bringing those images to their computer. In typical mobile app style, the UI is very simple and follows many natural behaviors mobile device users are accustomed to. You simply open your file from your device (or take a photo) and noise reduction happens right away with the preset selected at the bottom of the screen. Press and hold to see the before and release to see the after. It’s simple, but it’s effective. 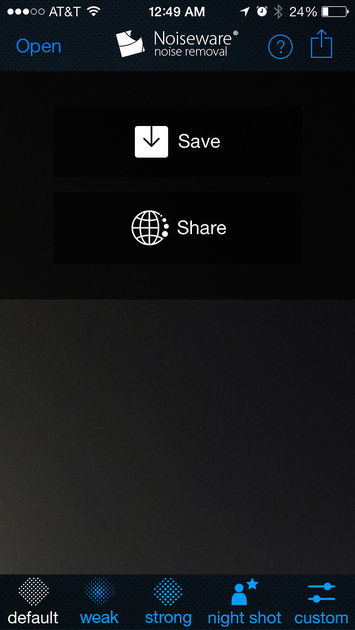 Once you are done you simply tap the top right corner to save to your camera roll or share via your iOS devices registered share methods (i.e., Facebook, AirDrop, AirPrint, eMail, Twitter, etc..). When you save there is a noticeable delay, but noise reduction that has complex algorithms to remove the noise without destroying the detail in your image takes time – it’s worth the wait! To my eyes (looking at the antennas) the detail preservation and noise reduction is better on the computer than in the app, but the performance of the app is close enough for most typical phone images. 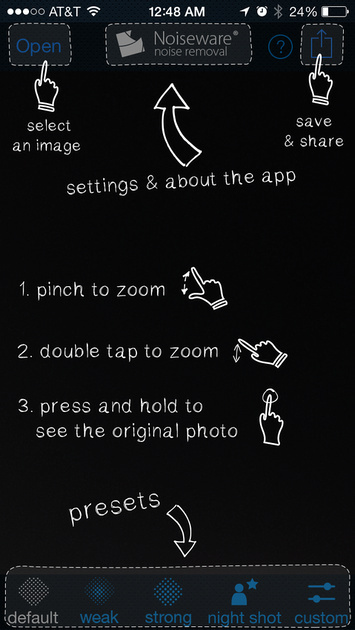 If you consider yourself to be a iOS artist with your camera you may still want to process your images in Photoshop, but the rest of the world will be pretty happy with the results from this app. In case you are wondering what that light is on the top left – that’s the beam of light coming out of the roof Luxor hotel (and yes I was wishing I could turn it off <g>). 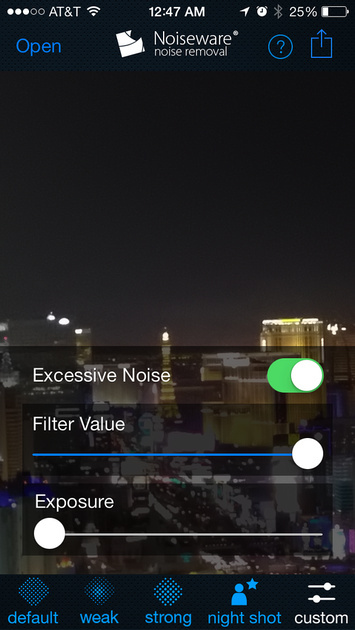 Now the cool thing about custom setting is that you can turn on more aggressive noise reduction and you can change the strength of the noise reduction (using filter value). While I wouldn’t use it here, you can change the exposure directly here. 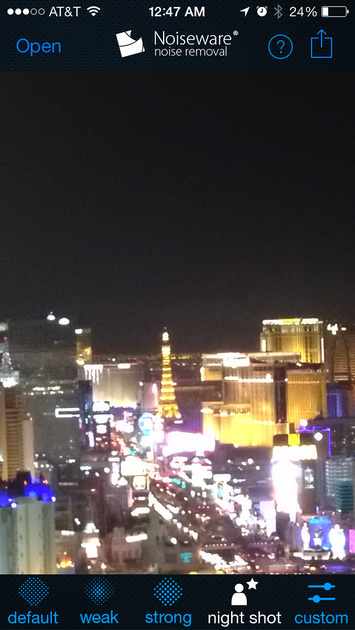 You can click the image above to view the full size version and click here to do the same with the before version. While this handheld shot has issues, you can certainly see the potential for improvement with my quick edit here. 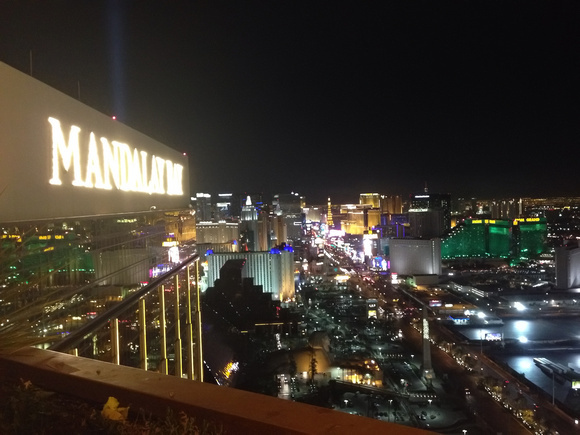 In case you are wondering what happened to the Luxor beam of light, I hid it in the darkness by putting a U-Point control in SnapSeed on the beam and darkened the brightness. It was simple, fast and effective. On an iPad much better results are certainly a given, but I limited myself to my phone for this review. While not as powerful as its Photoshop sibling, you get some great results in a hurry for a very reasonable price. Now I wouldn’t try to replace my Photoshop version of Noiseware with this, but it certainly gives me one less reason to bother editing an iOS photo on another device. 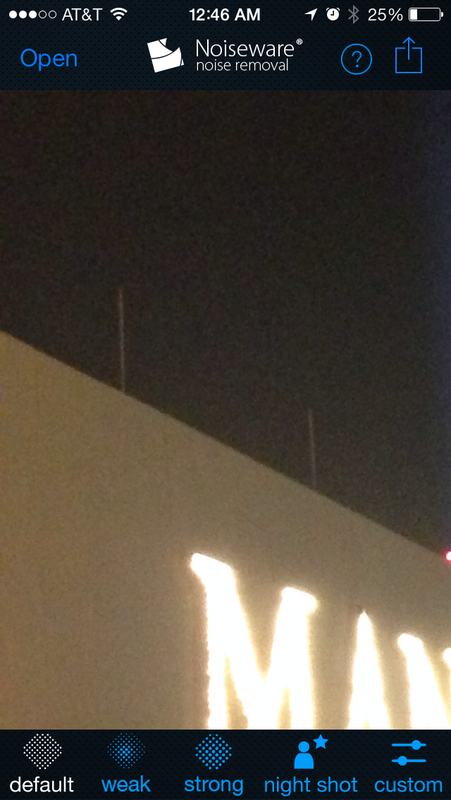 While I wish that zoom out feature would show me my whole image on my iPhone, I can live with this quirk. 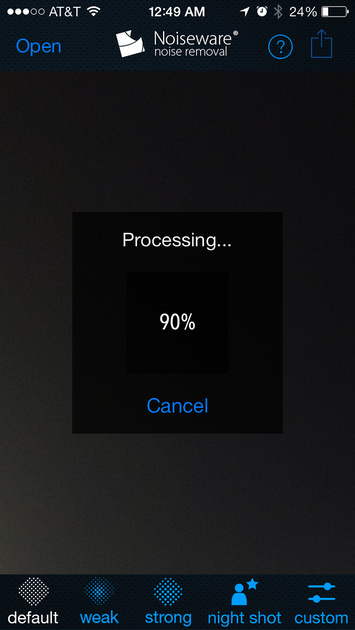 I’d also love to see this app work faster, but I’m happy to wait if faster means more detail destroyed in my image. Moving forward if I have an iPhone or iPad image that I care about, I’ll probably hit it with Noiseware for iOS if it needs some noise reduction, then finish off with SnapSeed as I have done in the past. They make a great phone photography tag team! Before I get a lot of emails, the answer is No. At this time this product is not being developed for Android or Windows mobile, but if the iOS version does well it’s reasonable to think that other platforms could be a possibility in the future. I am a featured photographer for Imagenomic due to my long standing appreciation of their products which I do use in my digital workflow. I do not receive any compensation for endorsing Imagenomic products nor am I compensated for being one of their featured photographers.